The government of Japan has adopted a basic timeline for the series of events and formal ceremonies surrounding the succession of the Chrysanthemum Throne, with Crown Prince Naruhito slated to become Emperor of Japan upon the abdication of his father, current Emperor Akihito, on Apr. 30, 2019. While historically, Japan has had emperors that abdicated in favor of their siblings or sons, especially during the pre-samurai Heian period (AD 794-1185), ever since the modernization of Japan during the Meiji period (1868-1912), succession to the throne has only occurred upon the death of the preceding emperor, with each emperor’s reign corresponding to a singular era name (that is later made their posthumous name). As such, Japan has only had four emperors since 1868: the Meiji Emperor (Mutsuhito, reigned 1867-1912); the Taisho Emperor (Yoshihito, 1912-1926); the Showa Emperor (Hirohito, 1926-1989); and incumbent Emperor Akihito, who ascended the throne upon his father’s death on Jan. 7, 1989. While the Emperor of Japan no longer possesses any “powers related to government” per the current Constitution of Japan drafted after Japan’s defeat in the Second World War, most of the pre-war traditional imperial rites and formal ceremonies have been preserved by the Imperial Household Agency, the government organization that manages most aspects of the roles and lives of the Imperial Family and the Emperor. In the year that followed the death of the Showa Emperor, Emperor Akihito participated in a number of ceremonies to formally ascend the throne, ranging from the presentation of the Imperial Regalia on Jan. 7, 1989 to the enthronement of Akihito as Emperor of Japan on Nov. 12, 1990. Emperor Akihito made a rare televised address to the Japanese public on Aug. 8, 2016, signalling his intent to abdicate owing to his advanced age and nearly 30 years on the throne. After a series of government consultations concluded in mid-2017 with Japan’s legislature formally approving a bill to permit Emperor Akihito to abdicate, the Dec. 1, 2017 meeting of the Imperial Household Council set the date for abdication as Apr. 30, 2019. The government then set up a committee, headed by Chief Cabinet Secretary Yoshihide Suga, to prepare a timetable for the ceremonial rites surrounding succession. Chief Cabinet Secretary Suga announced the preliminary timetable on Mar. 30, 2018, with the the abdication ceremony for Emperor Akihito set on Apr. 30, 2019. The Kenji-to-Shokei-no-Gi — the core accession ceremony of the new emperor, with the presentation of the Imperial Regalia and the State and Privy Seals — along with the Sokuigo-Choken-no-Gi — the new emperor’s first meeting with government leaders and representatives of the people — are scheduled to be held on the day after Emperor Akihito’s abdication. The Sokurei-Seiden-no-Gi — the formal proclamation of enthronement of Crown Prince Naruhito as Emperor of Japan — is scheduled for Oct. 22, 2019, which will be followed by the Shukuga-Onretsu-no-Gi — the ceremonial procession and presentation of the new emperor to the people. The Daijosai — the series of ceremonies in which the new Emperor prays for peace and abundant harvests and offers rice to his ancestors — is slated for mid-Nov. 2019, while the proclamation of the new successor to the throne will be carried out sometime in 2020. 2019 will be the 31st year of the current era of Heisei. 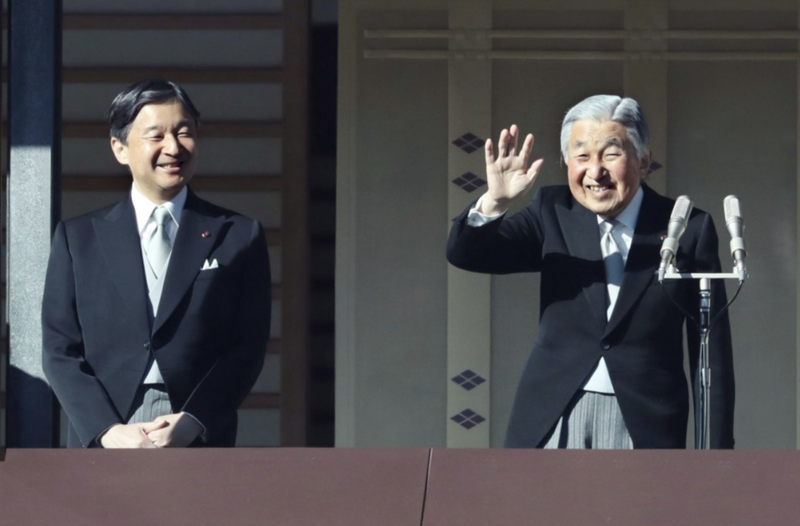 Emperor Akihito will mark the 30th anniversary of his accession to the throne at the end of Feb. 2019. Upon his abdication, per the custom in place since 1868, the Cabinet of Japan will determine a new era name to mark the change in head of state. Emperor Akihito will become the first emperor in just over two centuries to abdicate the Chrysanthemum Throne, with the last Emperor of Japan that abdicated his throne being Emperor Kokaku in 1817.